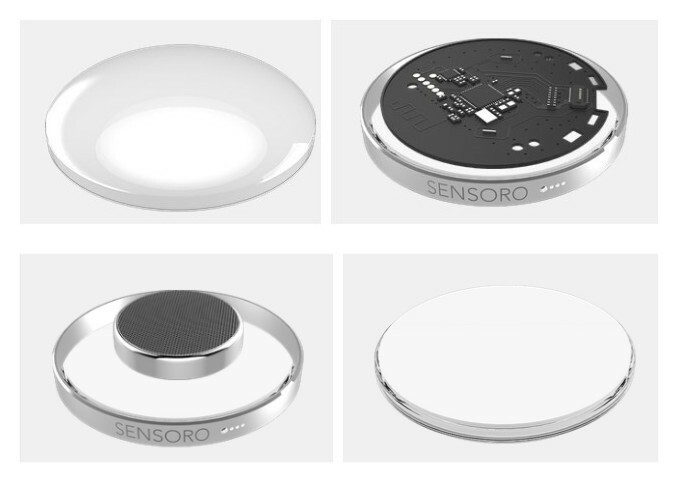 As one of the eight outstanding Chinese startups that TechNode brought to TechCrunch Disrupt SF this year, Beijing-based Sensoro is the developer of Yunzi, a smart wireless sensor enabled by Apple’s iBeacon technology that is run on Bluetooth Low Energy technology, aka Bluetooth 4.0 or Bluetooth Smart. The device works as both a sensor and a signal by detecting the location and movement of nearby smart devices, as well as transmitting information to them. It is sold at US$65.99 for each set of three Yunzi. Inspired by chess piece of Chinese game Weiqi or Go, Yunzi features an elegant and sleek design with dual-color injection modeling decorated by high strength alloy keel. With low-power acceleration chip and light sensor embedded, Yunzi understands the exact position and surrounding environmental conditions. The data collected can be used to interact with the mobile apps that has embedded Yunzi SDK. The battery life is up to 500 days, according to the company. In addition, the gadget is supported by enterprise level security configuration with an automatic sensor guard to prevent unwanted access. The configure RF is up to a maximum radius of 80 meters. As modern smartphone-obsessed users spend more time indoors, Yunzi has benefits in providing micro-location sensitive information to smart devices indoors, where GPS and Wi-Fi are not as precise. It can be used by both individual users at home and enterprise users in in-store and offline payment scenarios to enhance users’ shopping experience, etc. Although iBeacon technology is built into Apple devices operate on iOS7, it’s worth noting that the same BLE technology is also compatible with Android 4.3. and above. However, a major barrier in application of this technology is that customers have to turn on Bluetooth and location services on the relevant apps and opt-in to receive in-store or indoor notifications. A prominent competitor of Sensoro is Estimote, a Disrupt and YC alum, whose beacons (3 for $99) will hit market in October. Yunzi has been put into mass production now. Founded in July 2013, Sensoro is a Microsoft Ventures Accelerator alum, operating from Beijing, Silicon Valley and Seattle. The founding team members have once worked at organizations like NetEase, Microsoft Research Asia and China Aerospace Research Institute with expertise on large scale parallel processing, mobile internet, big data mining, digital circuits and inertial navigation. The company is planing to release a smart payment and authentication device compatible with Apple Pay.